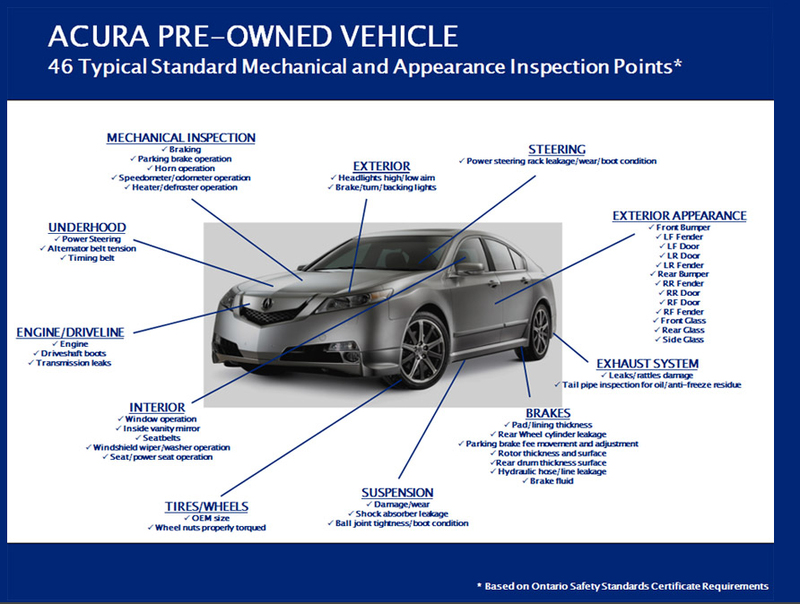 What is an Acura Certified Pre-Owned Vehicle? With an Acura Certified Pre-Owned Vehicle you're getting access to an exclusive selection of vehicles. Each of which has been carefully scrutinized and maintained to ensure it meets Acura's highest measures of performance, reliability, safety and value. 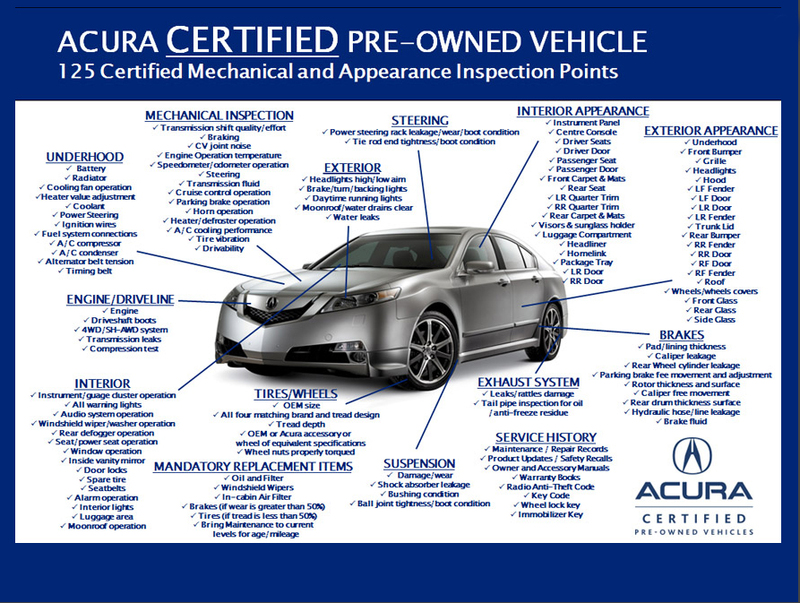 What are the advantages of an Acura Certified Pre-Owned Vehicle? Only select vehicles qualify for this program. To ensure long-term durability and performance, they must be a Canadian, late-model Acura and be screened for any body or frame repairs. Each vehicle is carefully inspected, detailed, and brought to current maintenance levels as set out by the manufacturer. The result is certainty that your Acura is among the highest quality vehicles on the road. And with financing options available through Acura Financial Services, it's luxury within reach.The path to becoming an Acura Certified Pre-Owned Vehicle starts with a rigorous 125-point inspection. Acura technicians scrutinize all major vehicle systems, including brakes, engine and powertrain, steering and suspension, tires, wheels, exhaust system and the vehicle's interior and exterior. Any component that falls below Acura standards is replaced with a Genuine Acura Part or restored to like-new condition. View our Acura Certified Pre-Owned Inventory here. **Neither Honda Canada Inc. nor any of its dealers will be required to accept return of a vehicle in certain circumstances including: (1) if the delivery date of the vehicle was more than 7 days prior to the day on which the customer is seeking to return the vehicle; (2) if the mileage on the vehicle at the time the customer is seeking to return the vehicle, is more than 1,000 km higher than at the time the vehicle was delivered to the customer; or (3) if the vehicle is not returned in the condition in which it was delivered, including where the vehicle has sustained damage since the time of delivery or where wear and tear on the vehicle since the time of delivery is considered excessive.